JK Residency is a lavish hotel that offers travelers a heightened level of luxury, accommodation, dining and entertainment services. With a stunning sunrise and glorious sunsets, it is the ideal destination for a stay in the heart of Steel City Jamshedpur. Located at the commercial hub Sakchi, it is perfect for a business trip and truly relaxing vacation. 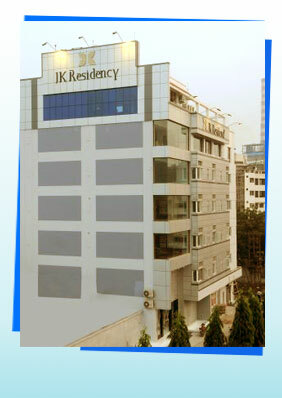 JK Residency likes to pamper its guests to the extent possible with almost all the facilities and comforts including 37 well-appointed elegantly furnished rooms and suites with all basic amenities including high-speed Wi-Fi connectivity. Every element in the hotel rooms have been designed to create a comfortable, modern and pleasurable environment. The efficient and friendly team assures that all guests have a comfortable and peaceful stay at the hotel. The well furnished rooms and service match the international standards. Besides an exciting mix of fine dining, leisure activities and comphrensive business facilities, the JK Residency also provides easy access to bustling Ranchi, (140 kms to the Birsa Munda Airport) the capital city of Jharkhand, rich in its history and cultural heritage.